Sheriffhall roundabout from the air. After at least two years, if not eight, the options for improving Sheriffhall roundabout have been put on display for public consultation. The original list of 8 options has been shortlisted to just 3. 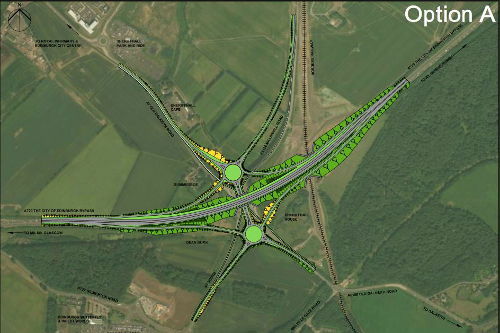 Each one includes a flyover of some sort for the roundabout which is consistently a bottleneck for travellers, either those on the bypass going west-east around Edinburgh or those going in and out of Edinburgh north-south. The options are variations on a theme. One has one large roundabout underneath a flyover for the bypass, another has a pair of ‘dumbbell’ roundabouts underneath the flyover and the third moves the site of the roundabout a few hundred yards west retaining the bypass at ground level with roundabouts above it. The detailed plans below were put on display this week at the Sheriffhall park and ride building. Transport Scotland officials and the consultants involved in the work from AECOM were present to answer questions. Disruption whilst the construction work takes place was one common question to the experts and there is no doubt going to be delays whilst the work takes place. Though as when the Borders railway built underneath the bypass there are ways of minimising disruption. The Borders railway prompted a number of people to ask asked how the flyover is going to be built now that the railway is in place. Fortunately the railway designers had the foresight to include this in their build. The current bridge over the bypass has been built in such a way that it is relatively straightforward to add on additional space at either side of the bridge to accommodate the newly raised bypass above it. No doubt there will be some temporary rail closures but this should be capable of being minimised. Though the third option, which moves Sheriffhall to the west, has the advantage that the railway bridge does not need to be extended, and so for this reason alone it may be seen as an attractive option. Disappointingly cycling does not seem to be at the forefront of the design considerations. An ‘indicative’ cycle way has been included, see the grey lines on the diagrams, but in these days of congestion, the popularity of cycling and a push to get commuters using bikes instead of cars then it is a shame that cycling does not feature more prominently. The current roundabout is a virtual no-go for the majority of cyclists but there is an opportunity to put cycling at the heart of the design. 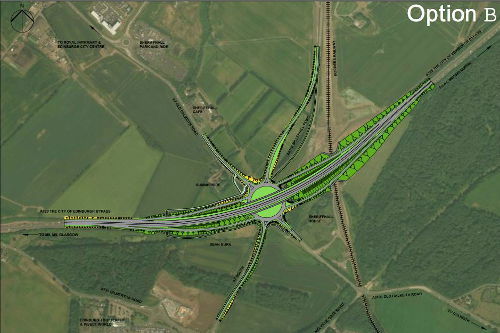 It would great to see an inspirational, iconic even, cycle bridge across the bypass. This would there to be seen as a symbol of Midlothian’s and Edinburgh’s desire to be attractive to cyclists. 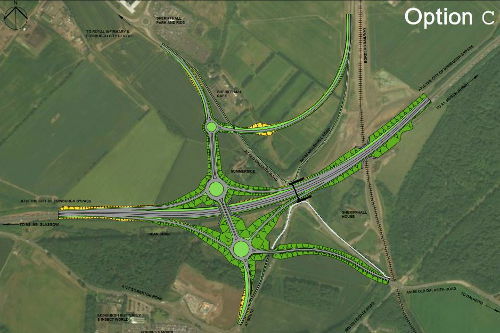 Instead of a cycle path that has to wind itself along the road and roundabout, do 180 hairpin turns to gain height, why not a cycle bridge to be proud of which takes cyclists on a direct route high above the bypass. Recent bridge building in Midlothian, with wooden decked bridges across both the Dalkeith bypass and the Bonnyrigg distributor road, show that imagination is possible on bridge design, so let us see such imagination applied to Sheriffhall. Imagine an iconic cycle bridge welcoming visitors to the area. Timescales for construction work was another keenly asked question this week. It would seem that we are not going to see bulldozers and construction lorries for a while yet. The current stage is the consultation on the three designs with the chosen option due to be chosen in Spring 2017. Followed by more detail planning, approval, funding, land purchase and procurement still to take place. It would seem the first sod is still over five years away from being cut, even on optimistic timescales. And that is where there the Scottish Government seemed to have slipped in yet another delay in the decision making process. Only in October the Transport Minister, Humza Yousaf, wrote to local SNP MSP Colin Beattie to assure him that the chosen option would be known by the end of financial year 2016/2017, the end of March 2017. However, the Information provided this week stated a date of Spring 2017. Yes, March is in spring but it is likely that the decision is to be delayed until April or May. A two month delay would not be so bad, if it were not for the 18 month delay that has already occurred. Back in January 2015 it was announced that the chosen option would be available in November 2015 but now we are heading for a May 2017 decision. So this is where local residents of Midlothian, East Lothian and Edinburgh need to start making their feelings known. They need to lobby their councillors and MSPs to ensure that the Sheriffhall roundabout is given the priority it requires and not be on an endless slippery road to more delay. So Midlothian View are making it easy for people to voice their support for the improvements at Sheriffhall roundabout. By completing the form below your comment will be sent directly to Transport Scotland. Unlike a lot of developments recently where there has been objections to plans, in the Sheriffhall case it is up to people to positively support the case for construction to ensure it gets done. Large Housing developments are due to take place across Midlothian, East Lothian and Edinburgh, not least at Shawfair where 4,000 homes are earmarked for building. If Sheriffhall is not improved then it’s current problems will be exacerbated. 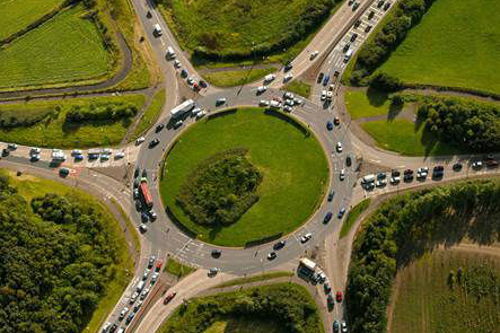 Transport Scotland are seeking the views of residents of Midlothian, East Lothian amd Edinburgh, as well as commuters and users of the Sheriffhall roundabout in regard to the proposed options for improving the roundabout. Use this form to submit your views. The improvements have been many years in the planning and dates have slipped several times, not least the 18 month slip on deciding the chosen option, so use this form to give the improvements your support, so that the Scottish Government can see the strength of support for the need to improve Sheriffhall roundabout.